It's a design concept from 1998, but still looks like the future. 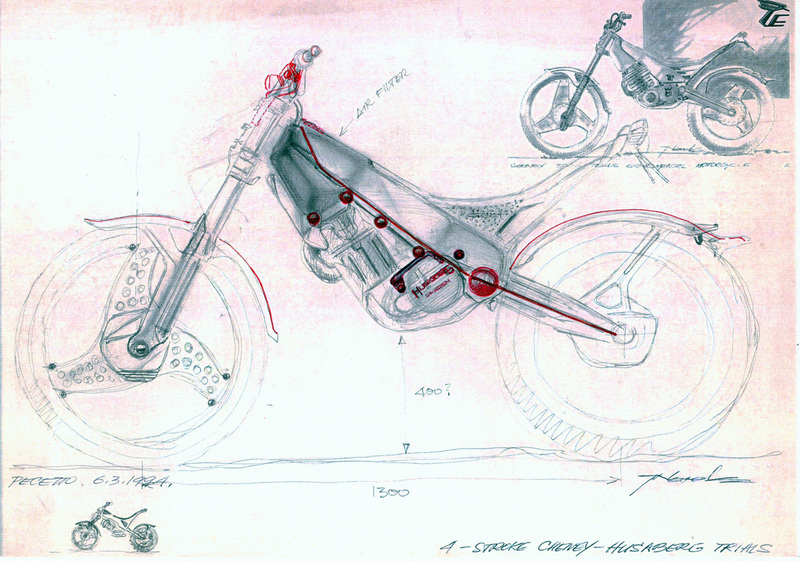 These three drawings of proposals for a sleek Royal Enfield touring motorcycle come from Justyn Norek, a retired car stylist who lives in Turin, Italy. The drawings date from 1998 and so do not show the Royal Enfield Unit Constructed Engine introduced in 2009. But it's easy to imagine how that clean, compact motor would only enhance this concept. ...imagine this graceful machine with Royal Enfield's UCE motor. Compared to the current Royal Enfield Classic 500, these proposals look sleek. They are "classic" and yet somehow more modern looking. "In the years 1983-2006 I was working in I.D.E.A. Institute as design director and we designed several scooters and worked for Ducati on the Multistrada project, as well as for other brands," Justyn wrote me. 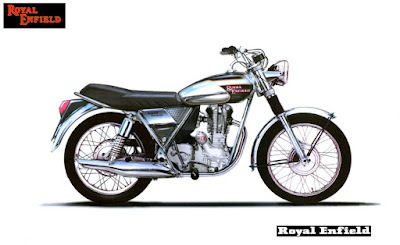 "For Royal Enfield we also proposed some concepts but never did a complete project." It's interesting to consider what might have been if these streamlined concepts had been manufactured. ...or, perhaps, with Royal Enfield's coming parallel twin! Justyn sent along other many drawings as well. "I am particularly interested in off-road bikes, but I love all kind of motorcycles," he wrote. He was involved in trials and motocross in the 1960s and '70s. His motocross photos of the period are stunning (see many of them at this link). As a designer, he has given thought to machines that "might have been." One example is his sketch for a classically styled Cheney-AJS trials motorcycle. 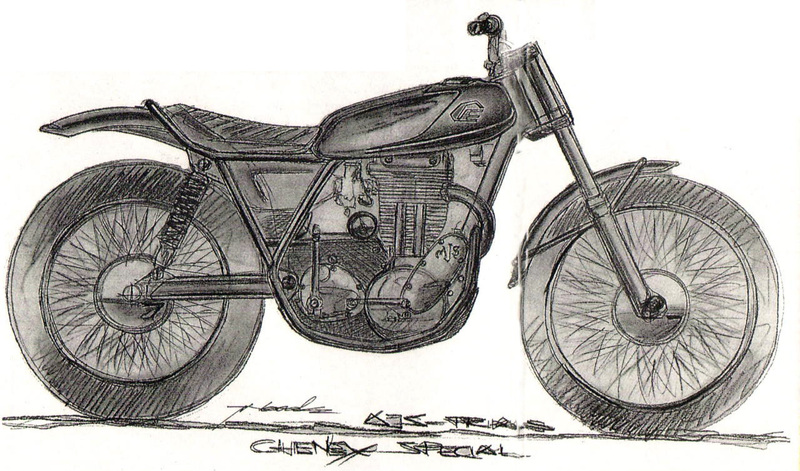 A Cheney-AJS trials as it might have looked. 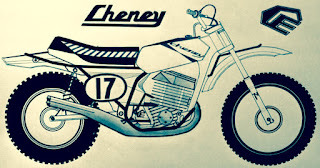 Cheney motorcycles were the creations of the late Eric Cheney, English racer and respected frame designer for off-road motorcycles back in the day. Here's a drawing Justyn did in 1967 for a Cheney two-stroke motocross bike. A 1967 look at Cheney. And then there was his drawing for a modern Cheney, which would have been powered by a de-tuned Husaberg engine. 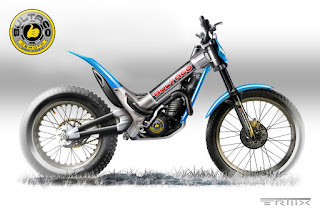 How a Cheney-Husaberg might have looked if developed. 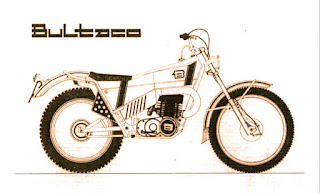 Here's a 1974 drawing of a Bultaco motorcycle. A Bultaco, imagined in 1974. 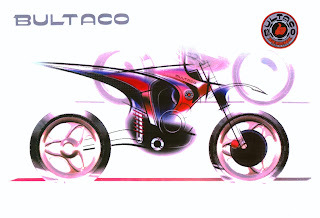 And a modern drawing of a possible electric motocross bike for Bultaco. A Bultaco we have yet to see. In 2009 he imagined a futuristic Bultaco trials bike with a modular frame built around a large-diameter carbon fiber tube. Variations in the attached headstock and seat base would make geometry and wheelbase variations easy, so 125cc, 250cc and 350cc versions could be "distinguishingly different." Slight variations in headstock and seat base angles would make different models possible. Justyn considers today's off-road motorcycles to be too similar in appearance, and continues to imagine how they could be improved. His creativity has long been recognized. Trials and MX News published an article in 1998 about Justyn's off-road concepts, entitled "The Future is Norek." The drawings used to illustrate that article — none of them then more recent than 1991 — still look futuristic. 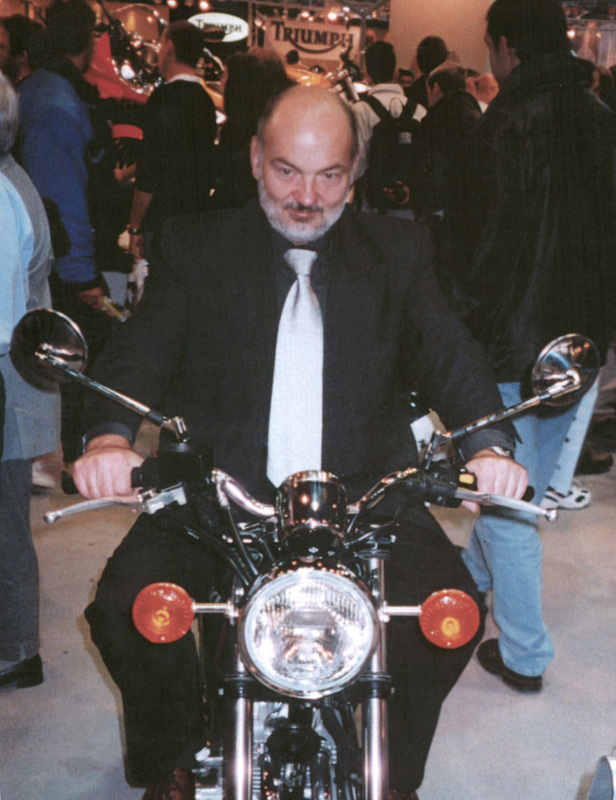 Justyn Norek at the New Delhi auto show in 2000. "The design process is long and difficult; it's also often full of compromises with clients. I was lucky to have lots of freedom with some research projects," Justyn wrote me. 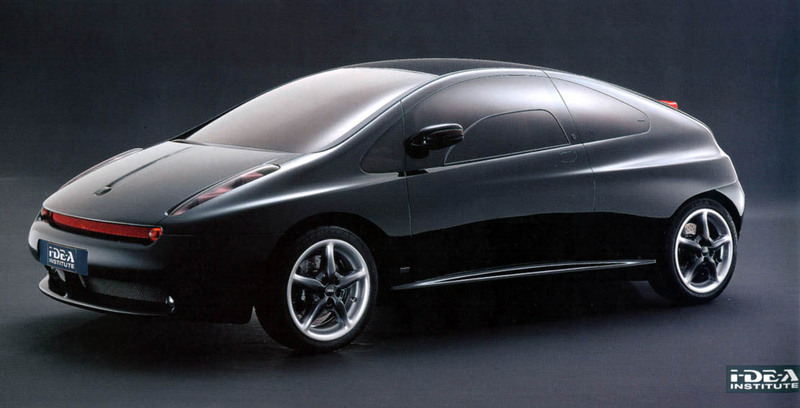 He named the Vuscia concept car of 1996 and the Lampo sport coupe concept of 1994 as particular favorites of his. Both were wind-cheating designs that would still look contemporary two decades later. The Vuscia was an idea for a six-seater multi-purpose vehicle. Solar panels on the roof would have powered fans to keep it cool when parked in the sun. The Vuscia concept car of 1996. The two-seater Lampo received third place in AUTOCAR magazine's unofficial rankings of design proposals for the Fiat Punto. The April 27, 1994 issue of the magazine quoted no less a figure than Nuccio Bertone saying "The Lampo is definitely my favorite." The Lampo (Lightning) sport coupe proposal of 1994.